Pros Solid steel maintains temperature consistently and will not drain or rust. Features a drain plug, which is useful while camping or on longer trips. Handles make it easy to transport, despite its size. Cons Opening the lid more than 90 degrees may stress the hinges and cause them to eventually break. Summary This is a bigger cooler, designed for camping, larger families or big tailgating parties. If you want the best cooler on the market right now, this is the one to get. 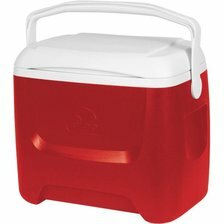 Pros This 38-quart cooler is a good size for families. 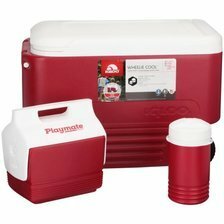 The mini Playmate cooler and the 1-quart beverage cooler add value. The handle and wheels make transport easier and faster. Cons The large cooler does not have a drain plug, the lid sometimes does not close as tightly as it should. Summary With the addition of the mini cooler and thermos, this is good value for the money. The handle greatly helps with transport. Pros Fits easily into most vehicles, keeps food and beverages cold and will hold 30 cans, plus ice. The lid is secure, which helps hold the cold temperature. Cons The lid will come open sometimes and may not keep items as cold for as long as other coolers. Summary A good size for a family picnic or to transport cold beverages and/or ice. It will fit into most vehicles and is of sturdy construction. 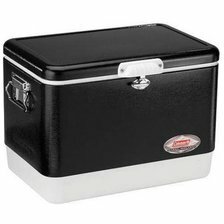 Pros The cooler has a telescoping handle and wheels which makes it easy to transport. 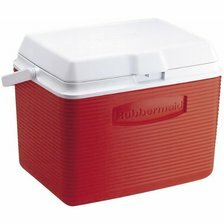 The 28-quart size is large enough for food and drinks but small enough to fit into nearly any vehicle. Cons Lacks separate pull-away handles; handles are molded into the body of the cooler. Does not always hold temperature as expected. Summary A smaller cooler that is able to handle the picnic or tailgating needs for an average family. It will fit into most vehicles, and the lid closes securely, reducing spills. Pros The molded polyethylene construction makes it incredibly sturdy. Will hold extremely cold temperatures for an extended period of time. The lid and handles are also very reliable. Cons The price may be a deterrent for some buyers. Summary A tough, rugged cooler; perfect for camping, tailgating, or picnicking. 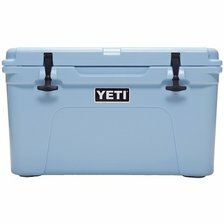 Our only concern is the price - does it make sense to spend more than $300 for a cooler?